Estonian President Toomas Hendrik Ilves made fun of Russian President Vladimir Putin in Twitter, LETA/Õhtuleht writes. Ilves referred in his post to the article by Moscow Times, which wrote that "live" cells of a mammoth were found in Siberia, which could be used to close mammoths. Ilves wrote in comment: "Meanwhile, after the tiger, the amphorae and the cranes, I have a queasy feeling I know what's next. Just sayin'." 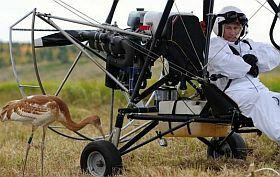 President Putin has fought a tiger, found two Greek amphoraes while diving and last week, taught cranes brought up in captivity how to fly. A few months ago, Ilves had a battle of words in Twitter with Nobel award winner Paul Krugman.